The best scopes for the .338 Lapua are designed and assembled specifically to endure a pounding from a particularly heavy-duty cartridge without compromising impeccable accuracy. The unforgiving slam of its recoil is, in no small way, a product of optimizing its performance to squeeze the greatest possible range and accuracy out of a large, hard-hitting caliber at some exceptional distances. That very force can and will eat an ordinary scope alive in the absence of a build intended to sustain both the scope’s zero and structural integrity after being thoroughly rattled by one round after another with such massive energy. There’s no substitute for crystal-clarity under conditions that call for an “ordinary” scope. When it comes to such an elite caliber as the .338 Lapua and the high-pressure situations in which it often sees action, it becomes an uncompromising demand. Steiner T5Xi – The Steiner T5Xi’s most prominent asset to its immaculate sighting picture is its 11-level illumination system with Battery-Saver mode and an Auto-Off feature that toggles on or off. Levels 1-4 are especially compatible with night vision. Like any quality scope worth its salt, Steiner thoroughly purged the oxygen from its 34mm-diameter tube and soundly sealed it from the interior for perfect waterproof and fogproof conditions. Throw in an extended sunshade, and you have one damn versatile all-around setup. Vortex Viper PST – The Vortex Viper PST (Precision Shooting Tactical) scope will match the Steiner in nearly every bullet point. Does it include a sunshade? Yes. Did it undergo a purge to lock out every atom of oxygen and make interior condensation unthinkable? Certainly. However, it tops the T5Xi with an admirable illuminated reticle for fast sighting and a total of six models with choices of the crosshairs in either the first or second focal plane. Millett LRS-1 – Here’s a scope that easily matches the wide, bright field of view offered by Steiner and Vortex’s respective scopes but truly perfects its reticle to take an edge over either. With clarity that already rivals the legendary standards of Leupold’s finest optics and three inches of spacious eye relief from that powerful recoil, the LRS-1’s (Long Range Scope) fully multi-coated lenses add an illuminated glass-etched Mil-DotBar reticle for drawing down on already sharp, high-contrast images with green sights against dark backgrounds and black against a light target. That kind of instantly adaptable sighting took my accuracy to whole new levels. As often as I say that a scope’s toughness can set a good design apart from a great one, it never rings truer than when one bolts optics atop a cannon of a rifle such as the .338 Lapua. In this instance, while I wouldn’t thumb my nose at any of these three models, two finalists on my short list took what I consider the ideal approach to maximizing durability. Steiner T5Xi – I have few negative things to say about the T5Xi. This stout scope will certainly hold its own round-after-round and never ask any quarter. For all its fine points, it just happens to be up against two of the most hardy scopes I have ever put through their paces and competing with one decided disadvantage: multiple interlocking parts. Millett LRS-1 – Scoff if you will, but in this particular comparison, I consider multiple assembled metal pieces a disadvantage. Keep in mind, these scopes will have some serious rumble going beneath them with every shot. Those seismic jolts have all the impact they need behind them to jar two or more previously joined components apart or out of place. Millett’s LRS-1 hard-wearing construction consists of a single-piece 35mm tube with tactical mounting rings that has been computer-tested against the kind of punch the .338 Lapua packs. Vortex Viper PST – Even the LRS-1’s simple-but-solid construction can’t quite match Vortex’s famously tough materials. Like many of their most acclaimed scopes, the Viper PST’s workings are housed by a single tube of aircraft-grade aluminum. It may measure “only” 30mm in length, but it weighs in at a muscular 23 ounces of can’t-bust-it ruggedness backed by a transferable, unconditional lifetime warranty. Yes, this scope will even outlast you. If you have ever fired any .338 iteration, you know that it does not feel like a cartridge created with long-distance shooting in mind. Considering the yardage shooters who routinely shoulder the .338 Lapua in particular expect it to cover, magnification matters tremendously to support the accuracy it takes for such a behemoth of a round to hit home. Steiner T5Xi – It pains me to say this about such an overall fine scope, but the T5Xi does its job admirably with 5-25x power and a par-for-the-course 56mm lens setup tailor-made for a long-range precision bolt rifle such as the .338 Lapua. However, it doesn’t really stand out beside the other two-thirds of this field. Millett LRS-1 – The LRS-1 will certainly dial you in up-close and personal with a fine, clear picture. With 6-25x magnification and a 56mm lens, it certainly has the power behind its zoom to suit the kind of extended range the .338 Lapua is known for conquering. However, while it overpowers the Steiner’s magnification slightly, it still can’t top the incredible capabilities of the Viper PST. Vortex Viper PST – Once more, Vortex blows away worthy competition by thinking of every possible way it can maximize its performance, starting with the gargantuan field of view its giant objective lens creates at high magnifications. The dial’s tactile stops at 12x and 8x magnification make fast, blind adjustments a snap. The Viper PST didn’t lose a millimeter of eye relief as I cranked the power up, a key feature considering just how hard the .338 Lapua could easily crack a shooter in the eye socket without enough gap between eye and lens. Finally, it’s one of the few scopes I’ve tested with ranging done in the highest magnification and doubling as it increases, with 24x shooting 1 MOA at 100 yards. Incredible. The higher settings bring smaller distant targets into crisp, clean focus. The lower settings keep it every bit as effective at closer ranges. Of course, this is what we all came for: when strapped to the top of this beast of a rifle, which of these scopes can zing home shots at distances that would normally call for a .25-06? 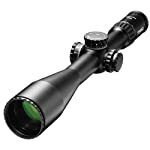 Vortex Viper PST – The Viper PST is just about as fine a scope as you will find anywhere. Its EBR-1 reticle’s precise MOA adjustments and phenomenally accurate windage and bullet-drop compensation over ridiculous distances make it a certified tack-driver across any yardage. From targets to hunting to tactical shooting, there’s no arena where the Viper PST won’t excel. Millett LRS-1 – At the longest distances, the LRS-1’s 140 MOA of adjustments and large target turrets become absolutely indispensable when the setting calls for fast, easy fingertip adjustments. The Mil-dot reticle simplifies bullet-drop and windage compensation to such an extent that any shot feels hittable. Not every scope can make daunting distances feel like chip shots. That’s exactly what the LRS-1’s glass-etched sights pull off with the revolutionary Mil-DotBar reticle’s thin line and illuminated dot for simplified rangefinding and holdover. Steiner T5Xi – As impressive as the Millett LRS-1 and Viper PST are when it comes to making otherwise iffy distances look and feel easy, the Steiner T5Xi takes commitments to pinnacle accuracy amazingly seriously. I couldn’t help but be impressed by its Special Competition Reticle (SCR) designed specifically with ½ Mil holdovers, a 2/10 Mil windage holdoff, and 1/10 Mil ranging brackets specially designed for extreme long-range shooting. Its side parallax adjustments helped steady my shots to bench-rest stability, even north of 400 yards. Finally, the completely resettable low-profile turrets allowed me to make spontaneous adjustments with ease and return to my original zero without missing a beat or fraction of an MOA of accuracy. At this rate, finding the Vortex Viper PST to be the best scope for the .338 Lapua should not surprise me in the least. The Vortex brand may be a relative newcomer to high-end sporting optics compared with institutions such as Bushnell, Browning, Nikon, and Leupold, but from astoundingly durable materials and a fondness for streamlined one-piece designs to some fascinating takes on pinpoint accuracy, it won’t be an underdog for long. The Viper PST is considered one of their high-end products and I cannot argue. This is a big, tough, remarkably precise scope with the moxie to take the .338 Lapua’s stiffest blows and come back for more, again and again.